CORVALLIS -- With six seconds remaining, Clackamas' Jeffrey Nelson was more excited than he was nervous. Nelson drilled a 37-yard field goal with three seconds to play, lifting the Cavaliers to a 31-30 victory over South Medford in Saturday's OSAA Class 6A football state championship game at Reser Stadium. 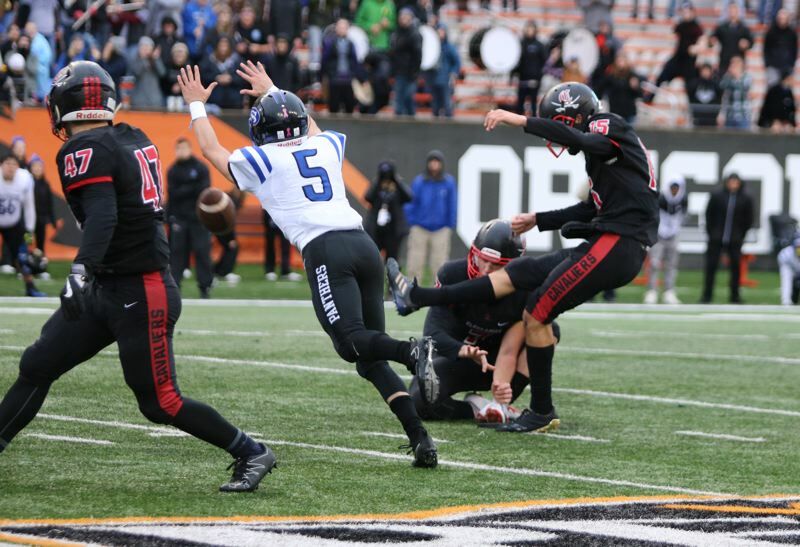 The game-winning kick, Nelson's second of the playoffs, gave Clackamas its first lead of the game as the Cavaliers capped a perfect 14-0 season and clinched their first state title. "It's every kicker's dream to hit a game-winning field goal, much less in the state championship game," Nelson said. "Down by two, six seconds to play … that's what we draw up in the back yard as kids when we kick field goals. "It was everything I could ask for." South Medford (12-2) jumped out to a 10-0 lead in the first quarter and then traded punches with the Cavaliers, who stayed in the game behind James Millspaugh's three rushing touchdown and Mitchell Modjeski's 17-yard touchdown pass to Cole Turner. Leading 30-28, the Panthers had a first down at the Clackamas 32-yard line with 1:45 to play when senior running back Jaylin Parnell fumbled after taking a hit from Cavaliers' linebacker Justice Pagan. Braelen Bettles recovered for the Cavaliers, giving the Mt. Hood Conference champions the ball at their own 21 with 1:39 to play. "Our coaches ask us, 'What's the most important thing?' It's the ball, because that's what wins us the game," Bettles said. "I don't know who forced the fumble. I just went and grabbed it as fast as I could." Clackamas then went 59 yards in nine plays with Modjeski picking up the final few yards on a quarterback draw to the South Medford 20-yard line before the Cavaliers called their final timeout, setting the stage for Nelson with six seconds remaining. "I was calm," Nelson said. "My career long was almost 10 yards beyond that, I love kicking from the left hash mark, and I knew if I stepped up and put a good swing into it that I was going to make it. I had no reason to be nervous." South Medford then called a timeout, giving Modjeski a chance to chat with Nelson, who hit a game-winning 42-yard field goal in the Cavaliers' 17-14 quarterfinal win over Central Catholic. "I just said, 'Think about how many times you've made this before,'" said Modjeski, the senior quarterback who also is Nelson's holder. "I mean, we kick field goals in practice every day, and he's almost automatic. "And then he said, 'Yeah, I've got it.' And once he said that, I knew it was going through." South Medford's Trent Snyder got the ball on the ensuing kickoff, but had nowhere to run as time expired and one sideline erupted in celebration while the other stood brokenhearted. "It wasn't a shock that we were here in the final," Panthers coach Bill Singler said. "I really felt we were the two best teams that made it to the finals, and we feel that way today in our play. "Nobody gave it to anybody, nobody lost it, somebody had to win it in the end, and that's what happened. So, it was a well-played, hard-fought game. You wish nobody had to lose this game, but in sports, somebody wins and somebody loses." South Medford's Jaalen Owens caught two touchdown passes and kicked a field goal and two extra points before leaving the midway through the second quarter with a back injury. One of the key turning points in the second half came when South Medford quarterback Robbie Patterson scored on a 5-yard run with 7:11 to play in the third quarter and back-up kicker Peyton Shipley pushed the extra-point try wide right, leaving the Panthers with a 30-21 lead. The Panthers then went three and out on each of their next three possessions, twice punting from their own end zone. "Defensively, we needed some time to get used to South Medford's multi-dimensional offense," said Clackamas junior linebacker Jake Bushman, the coach's son. "We told ourselves we just had to keep playing Cavs' football and I think we showed that a lot in the second half. "The confidence started to flow and then we just flew around to the football and made some big plays." After Millspaugh scored on an 8-yard run to pull Clackamas within 30-28 with 1:50 to play in the third quarter, the Cavaliers came away empty on each of their next three possessions. When Clackamas turned the ball over on downs at the South Medford 42-yard line with 4:06 to play, and then the Panthers converted on fourth down at midfield with 2:17 left, it looked as if the Cavaliers might not get the ball back. Then Parnell, the two-time Southwest Conference offensive and defensive player of the year, fumbled for the second time in the game. "Clackamas still had some timeouts, so we couldn't just sit on the ball," Singler said. "I thought we had it in good shape. It's a darn shame that fumble had to occur. "Jaalen is such a tremendous player; one of the top three players in the state, in my mind. But Clakcamas made a nice tackle and the ball popped out. We had an opportunity, obviously, to put it away, but sometimes life throws you curve balls." Clackamas coach Joe Bushman praised his players for their determination and grit as they rallied from a 24-14 halftime deficit. "It's not like we hadn't come back before, but it seemed like every time we scored, South Medford had an answer," Bushman said. "But football is a game of breaks, and it was our turn to get a break there on that fumble. And give our kids credit. That was a heck of a drive with 1:39 left. "We kind of had to dink and dunk our way down there. It wasn't like South Medford was going to let us have any big plays, so we had to be able to protect and play catch, and we did that." Modjeski completed 18 of 29 passes for 230 yards and completed passes to six different receivers. Aric Bergers led the Cavaliers with seven receptions for 74 yards, Thomas Tolonen had four catches for 42 yards, and Turner added three catches for 43 yards. "The plan definitely wasn't to play from behind, but we wanted to be pretty even with run and pass, and we were 233 rushing and 230 passing, so I think as the game went on, we stayed pretty true to our game plan. "Really, it was just perseverance from our team in general, on offense, defense and special teams. The coaches kept us positive the whole time and we just fed off the coaches' positive energy." Millspaugh was the game's leading rusher with 29 carries for 160 yards, running behind an offensive line anchored by tight ends Chad Bletko and Tyler Vaughn, tackles Hudson Bishop and Brian Espinoza, guards Devin Fogarty and Alex Hall, and center Dash Johnson. "I'm so glad I got the opportunity to help these guys win and so glad I got a chance to be a part of this great team," said Millspaugh, who transferred to Clackamas from Skyview High School in Vancouver for his senior year. "We just believed in ourselves. "At halftime, we told ourselves, 'We can do this thing.' We just chipped away, chipped away, and eventually we broke the rock. That's our motto at Clackamas: 'Pound the rock.' If you grind every day, eventually the rock will break, and after all these games, all these practices, and all the off-season workouts, it's a great feeling." Turner, another of the 21 seniors on the Cavaliers' roster, called the win "a special ending to my senior year in football. I'm proud of all my brothers on this team and I can't wait for what the future holds. "It's surreal right now. What we did here today probably will hit home a couple of days from now when I have to go to basketball practice." Joe Bushman, who played quarterback on Benson's 1988 state championship team that also went 14-0, also was overjoyed to see the Cavaliers go the distance after falling in last year's semifinals to eventual state champion West Linn. "I'm still kind of in shock, to be honest," Bushman said. "It means a lot of represent our school and our community. It's really special to share it with my son and so many of his friends that I've known since they were little. "And then just to go through this long ride with a coaching staff that I just love to death. We're all friends and we all have our different things that we bring to the table, but I give it to those guys. "It's tough sometimes when your back is against the wall to keep believing and keep keeping the kids positive, but I didn't see any wavering at all from our staff, which is just awesome. It's what you need."